According to the CFA, the Singapura cat is accepted for show only in the color type known as “Sepia Agouti” which is dark brown ticking on an old ivory color undercoat. Each hair should have at least two bands of dark ticking separated by light bands. Fur should be light next to the skin and have dark tipping. Eyes may be hazel, green or yellow, with no other colors being allowed for show. This breed’s coat is fine, very short, silky texture and lies very close to the body. Almost care free, an occasional brushing is all the care required to keep this pretty breed looking that way. The Singapura's reputation is that of a "pesky people cat”. An active, extroverted, curious, playful cat, it is fortunately not really destructive. A curious supervisor, the Singapura will insist on helping you with everything you do. 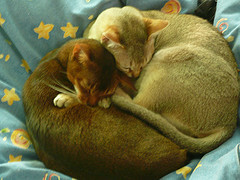 They are very intelligent and love to be close with their humans and remain very playful and loving even into old age. A fun-loving and sweet disposition is one of their most endearing attributes. Singapuras should appear to be alert, healthy and generally are of a small size. A muscular bodied cat with noticeably large eyes and ears in proportion to their head, the Singapura is uniquely small. Many veterinarians seeing a Singapura for the first time think something might be wrong with the kitten since it is so small. The tiny size is entirely normal though. 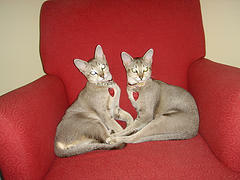 The Singapura is slow to develop and will not attain its full size (5 to 8 pounds) until about 15 to 24 months of age. Their lovely ticked coat and bright eyes combine with dark lining around the nose to make this breed look like a precious little toy. Initially, admirers are drawn to the Singapura cat’s deceptively delicate appearance and sweet little cupie doll face, but the thing that truly captures and enchants is the Singapura's charming personality. This cat's curiosity, intelligence, playfulness and unique appearance are almost irresistible. Singapuras truly seem to need the companionship of their humans. Desirous of human interaction, this pushy little cat will insinuate himself into the midst of activity whenever he can. Singapuras are so smart and can be easily trained. The only problem is they often seem to be better trainers of us than we are of them. Patience, repetition and consistency are required. These fascinating felines with their large eyes and exceptional hearing don’t miss much, and will curiously investigate everything in their environment. They really are little friskies, curious and amazingly intelligent. Singapuras just know they can do anything and everything and that confidence makes them appealing. This breed is happiest with avid cat lovers who are not gone for long periods and who will lavish them with lots of love and attention.